L'Art en relació amb l'home etemi l'home que passa. [Barcelona]: Amics de Sitges and sold by Salvat-Papasseit, 1919. Twelvemo. Original wrappers (probably after Torres-Garcia). Case by Cambras w/design after Torres-Garcia. 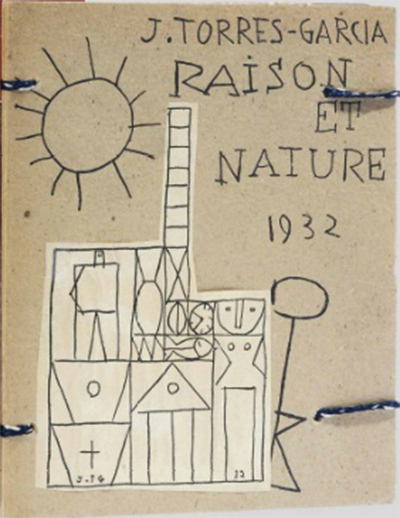 On November 29, 2012, Christie's-South Kensington is offering a fiesta of books associated with South American Modernism at their Fine Printed Books and Manuscripts sale. 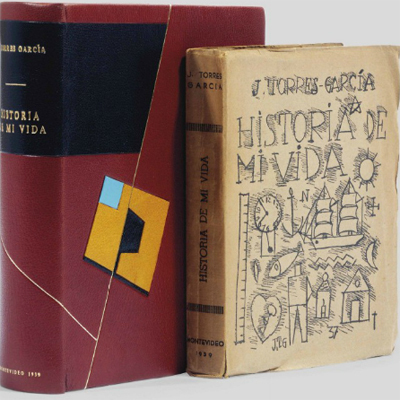 Amongst books by Neruda, Gabriel Garcia Marquez, and Borges ia a selection of first editions by Joachim Torres-Garcia (1874-1949), the Uruguayan artist, theorist, and writer who introduced abstract art to South American culture after moving to New York City in 1920. TORRES-GARCIA, Joachim. Raison et nature. Paris [Montevideo]: Imán, 1932 [but later]. and drawings. Case by Cambras. Born in Uruguay's capitol, Montevideo, Torres-Garcia studied drawing as a seventeen year-old, and when the family moved to Barcelona in 1892 he enrolled in Escuela de Bellas Artes de Barcelona. His earliest work was influenced by French Impressionism and his paintings were exhibited. He soon began to paint frescoes, murals, and design stained glass. He possessed an idealist conception of art and followed the ideology of Catalan nationalism bringing its themes into his work. TORRES-GARCIA, Joachim. Historia de mi vida. 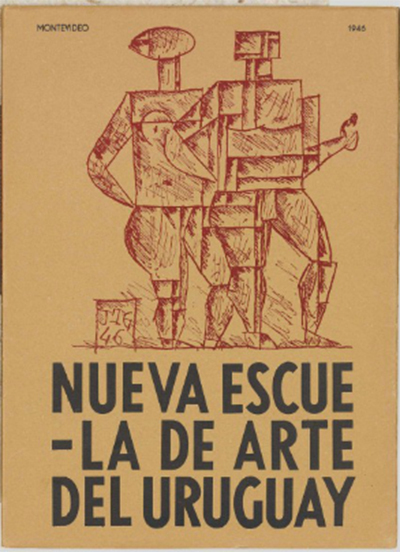 Montevideo: Asociación de Arte Constructivo [the author],1939. Octavo. Illustrations throughout. Original wrappers. 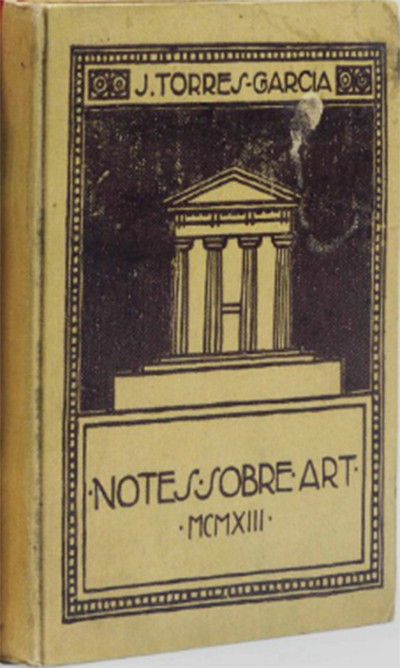 But his first book, Notes sobre Art ("Notes on Art"), published in May 1913, marked the de facto break with the Catalanistas. Slowly and inexorably he moved toward Modernism and abstraction while developing his progressive art theories, and in 1920 moved to Paris and then New York City where he mingled with the expat Parisian and American artists who were turning the art world upside down. He never returned to Barcelona. Nueva escuela de arte del Uruguay. 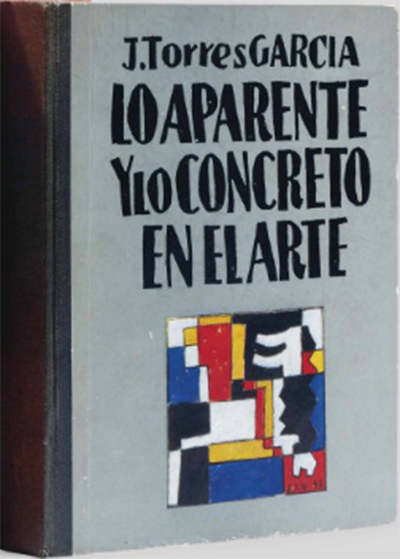 Montevideo: Asociación de Arte Constructico, 1946.
illustrated after Torres-Garcia. Inscribed by the author. Broke and with a family to support, he returned to Europe, settled in Italy, and turned to toymaking, founding the Aladdin Toy Company. Encouraged to take up his brush once more, he exhibited to favorable reviews, returned to Paris in 1926 and began his association with the Constructivist movement to which he brought the order and logic of geometry and proportion to composition. Lo aparente y lo concreto en al arte. Octavo. 32 plates. Original cloth backed illustrated boards. He left Paris once more in 1932 and migrated to Madrid where he established the Grupo Constructivo. Two years later, he packed his family and moved- this time for good - to his native Montevideo, where he was received as a member of the European artistic elite, and founded the Sociedad de las Artes del Uruguay. By the late 1930s, Torres-Garcia had begun to integrate Pre-Columbian and indigenous Native American symbolism into his work. Terrassa: Mulleras & Co. [for the author? ], 1915. Octavo. Original cloth. Morocco case by Cambras. His aesthetic-philosophical artistic theory of Universalismo Constructivo ("Constructive Universalism") was published in 1944 based upon the principles of proportion, unity and structure organized on a mystic theory of order. 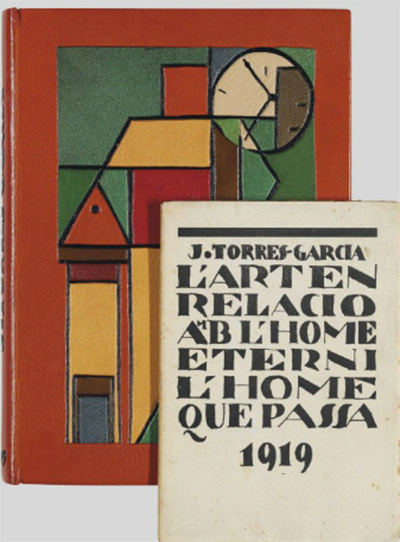 TORRES-GARCIA, Joaquin. Notes Sobre Art. N.p. [Terrassa? ]: Printed by Rafel Masó [for the author? ], 1913. Octavo. Title with illustrations after "M.P." Four headpieces after Torres-Garcia. Original cloth, by Eduard Domench of Barcelona. 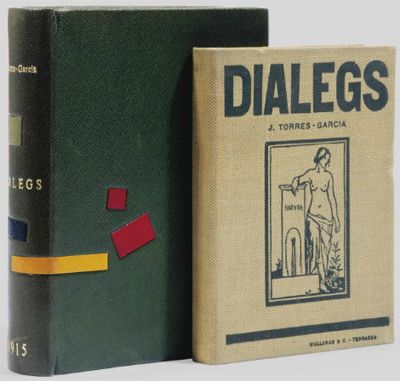 Torres-Garcia's influence upon Latin American artists was incalculable. It was he who called upon them to embrace their local roots and bring their heritage to bear in their work through a modern artistic language of which he was a key developer. When discussing Latin American art in the twentieth century all conversation leads back to Torres-Garcia. With over thirty-five writing credits to his name, Torres-Garcia was as fluent and influential as an author as he was an artist.